It’s often said that finding a therapist is like dating: The process is intimate, sometimes intimidating, and may require patience before you find “The One.” Connecting with your perfect therapist is the first step on your path to mental wellness, and the right platform makes it easier. And – just like with dating – there are different ways to go about it. You might be able to connect with a potential therapist in a single swipe, or you may prefer meeting someone face-to-face. Luckily, it’s 2018, and you have options. 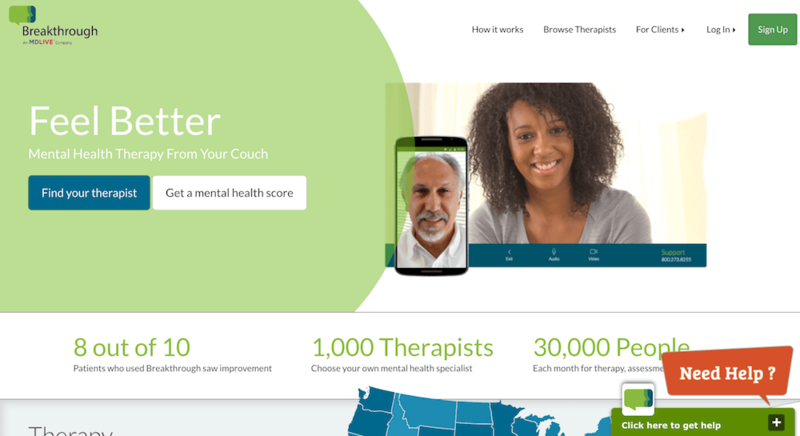 The mental wellness industry is eternally evolving and adapting to user demands, and there are several therapist finders on the market. We compiled the top therapist directories available, and broke down the pros and cons for each. Zencare.co provides a user-friendly platform to help individuals find the best, highest-quality mental health care. 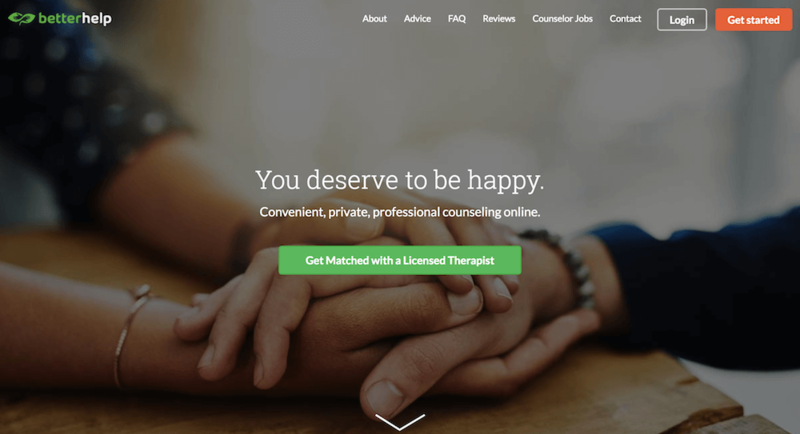 Zencare streamlines the therapist search process from five weeks to five minutes with accurate information, quick response rates, and quality care. Up-to-date availability and insurance information on all our therapists in New York City, Boston, and Rhode Island. Get a feel for each therapist’s style and personality by watching introductory videos about their practice. No more phone tag: You can easily schedule a free 15-min phone consultation with your therapist of choice. Trusted providers: Every therapist has been background and licensed checked, interviewed, and fully vetted by our clinical team. Prioritize criteria that matter to you: Filter by insurance, fees, availability, specialty, language, gender, and more. Search both therapists who are in-network with insurances, and those who accept lower fees on a need basis. Find both in-person and online therapy appointments. The Zencare team is available to help you get connected and find specific therapists. Our selective vetting process means a slimmer selection of potential therapists. Website is free for therapy seekers; cost per session varies based on provider and insurance rates. Psychology Today (sometimes formatted as “PsychologyToday” or “PT”) is a bimonthly print publication that covers the diverse, interesting aspects of human behavior and mental health. On its website, PT has an extensive online directory of therapists, psychiatrists, support groups, and treatment centers. Like the yellow pages of therapy, the PT directory features a large number of practitioners across the United States, Canada, Australia, and the United Kingdom. The PT magazine often features insight on current topics from leading figures in the mental health industry. Given the expansive nature of the provider network, it may be difficult to identify the best therapist for your specific needs. Since any therapist can be listed, the directory includes some unlicensed and trainee clinicians. Information is sometimes outdated, with schedules and availability that may be inaccurate. The Psychology Today website is free for therapy seekers; the cost per session varies based on provider and insurance rates. 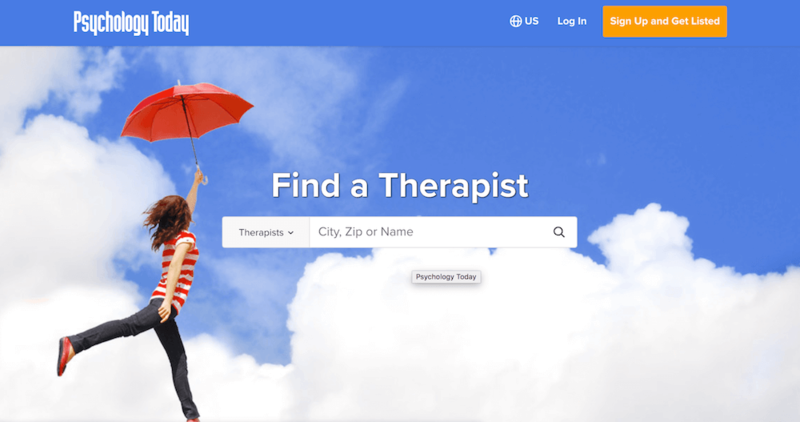 GoodTherapy is an online directory that connects therapy seekers with therapists and treatment centers. The website also has a blog and “Psychpedia,” an extensive list of common prognoses. Clients can seek help using handy filters, such as preferred language, evening availability, and different approaches to therapy. All practitioners are committed to the company’s ethical therapy practices. As with other major therapist directories, it can be difficult to navigate the expansive GoodTherapy website. You have to call or send a message to the therapist; there is no option to schedule an introductory call. The GoodTherapy website is free for therapy seekers; the cost per session ranges based on provider and insurance rates. ZocDoc is an app and website that matches patients with doctors, filtering predominantly for providers who are in-network. The company aims to streamline the booking process by making appointment availability visible, and providing patient paperwork upfront. After a visit, patients are prompted to fill out a ZocDoc review. This provides valuable feedback from verified patients on topics like wait time and bedside manner. ZocDoc includes doctors across specialties, so you can have all your medical providers and insurance information in one place. 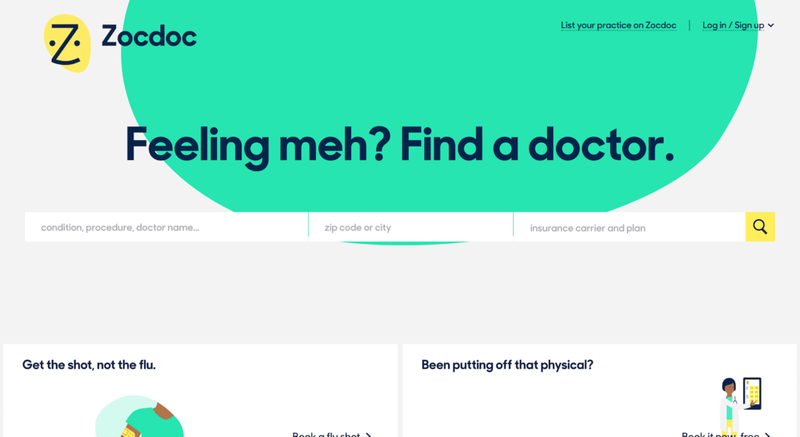 Since ZocDoc is for all types of medical practices, it hasn’t been designed to help therapy seekers find the best match based on specialties and personal fit. Not every doctor can afford to register on ZocDoc, since the steep enrollment fees may deter therapists, especially those in private practice. As a result, the number of in-network therapists is significantly limited. The ZocDoc website is free for therapy seekers; the cost per session ranges based on provider and insurance rates. Doctor on Demand connects patients with doctors, 24/7 through online video calls. For minor, urgent issues – such as the flu or a UTI – it saves users a trip to the clinic. The site also provides resources for treating mental health issues, such as postpartum depression and anxiety. No time wasted in a waiting room. This is especially helpful if you’re traveling and need prescription medicine on-the-go, or want a quick medical referral. Some companies offer Doctor on Demand services as a company health benefit to allow employees to see doctors remotely. Clients may find remote therapy convenient for reasons related to accessibility, travel, and timing. Only certain employer health plans are accepted in-network. Some therapists struggle to diagnose clients they’ve only met remotely. Others may not feel comfortable providing remote therapy to patients who are at high risk, such as individuals who have suicidal thoughts. $75 for a 15-min consultation with a medical doctor. My Wellbeing creates a direct link between patients and therapists in New York City. Potential clients fill out a brief survey to determine what they’re looking for in a therapist, and the My Wellbeing team contacts them with a personalized recommendation. The small, intimate team is able to provide knowledgeable recommendations for potential patients. The My Wellbeing team works with clinicians to arrange pre-negotiated rates that may be lower than the New York City average. At the time of writing, the company is limited to service in New York City. 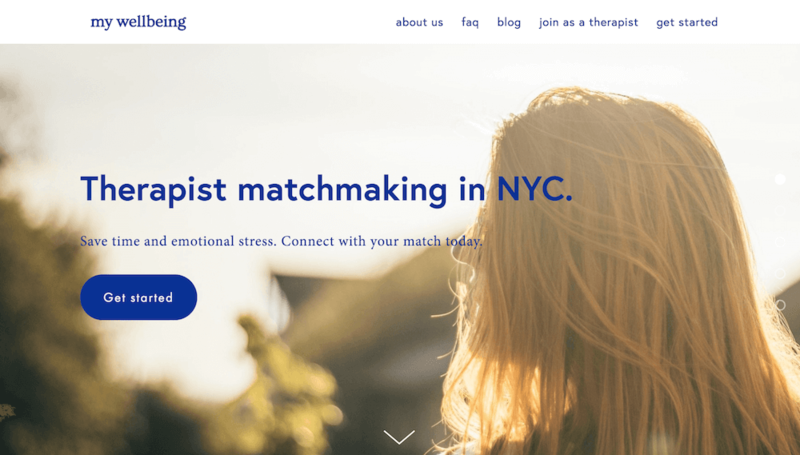 Since the service is set up to be a therapist-patient matchmaking service, clients can only be in touch with one potential therapist at a time. Therapy seekers can’t see their therapist options until they’re given recommendations by the team. The My Wellbeing website is free for therapy seekers; the cost per session ranges based on provider and insurance rates. Lighthouse is a New York City-based directory of health and wellness providers specifically for the LBGTQ+ community. The Lighthouse team vets every provider to ensure their experience and sensitivity in treating and caring for LBGTQ+ individuals. As of now, Lighthouse only operates in New York City. Thanks to its (very important!) emphasis on the LQBTG+ community, Lighthouse is a niche service – meaning it’s not the right fit for everyone. 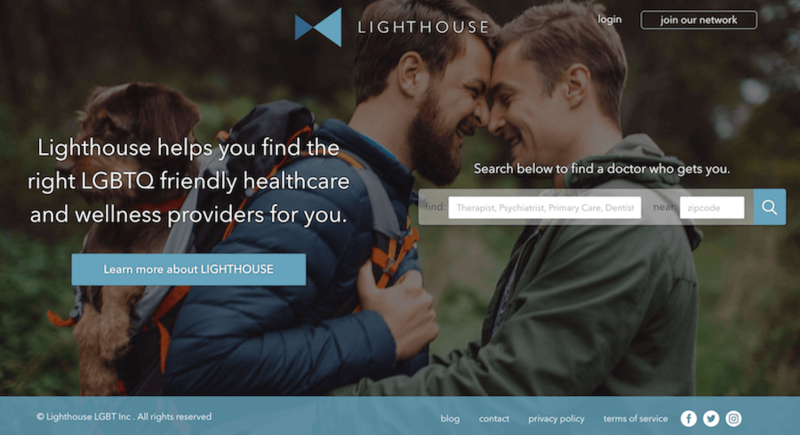 The Lighthouse website is free for therapy seekers; the cost per session ranges based on provider and insurance rates. Talkspace provides users with text-, audio-, and video messaging-based therapy, all accessible via the app or website. When you sign up, you’re prompted to complete a short intake. The Talkspace algorithm pairs you with several options for a therapist, and you select your choice from that short list. Since the platform does away with in-person meetings, the cost may be lower than traditional talk therapy. Users are able to send notes to their therapist at any time (although unless otherwise arranged, your therapist will only respond when she or he is able). No awkward breakups: If your therapist isn’t a fit, you can easily switch to a new one. Users have reported that the responses on Talkspace can feel impersonal and even slightly robotic. Unlimited Messaging Therapy Plus: $49/week (billed as $196 monthly). Couples Therapy: $79/week (billed as $316 monthly) or $71/week (billed $852 every 3 months). Like Talkspace, BetterHelp is an e-counseling platform. After filling out an initial questionnaire, an algorithm matches you to a therapist. Also, patients have the option of using a nickname so as to remain anonymous (your therapist will know you only as the name you provide). 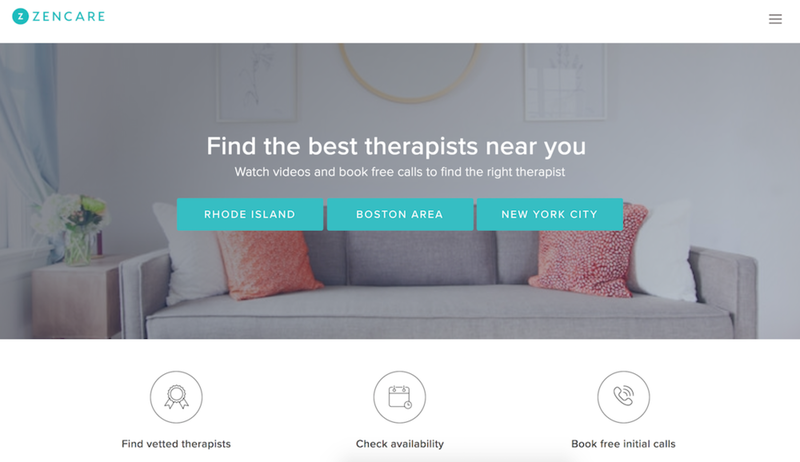 The remote component provides the convenience of being able to connect with a therapist from anywhere. You have 24/7 access to a “chat room,” where you can leave messages for your therapist. Plans come with unlimited chatting via desktop/app, phone and video. $35 to $80 per week. Rates vary, according to frequency of billing. Curious about the difference between BetterHelp and Talkspace? Check out our explanation of the cost and convenience of BetterHelp vs. Talkspace! Breakthrough is a platform for video counseling. Patients scroll through a list of therapists and psychiatrists, and use a calendar interface to set up an appointment for a session. You can also interact with the therapist via a message or chat box. Studies indicate positive potential in the efficacy of tele-therapy as a standalone treatment. Flexibility and convenience of having an appointment anywhere and at anytime. Breakthrough works with most major insurance plans. As with other e-counseling platforms, there are limitations to a client-therapist relationship that is exclusively virtual. Some therapists struggle to diagnose clients they’ve only met remotely, and others may not feel comfortable providing remote therapy to high-risk patients. The Breakthrough website is free for therapy seekers; the cost per session ranges based on provider and insurance rates. 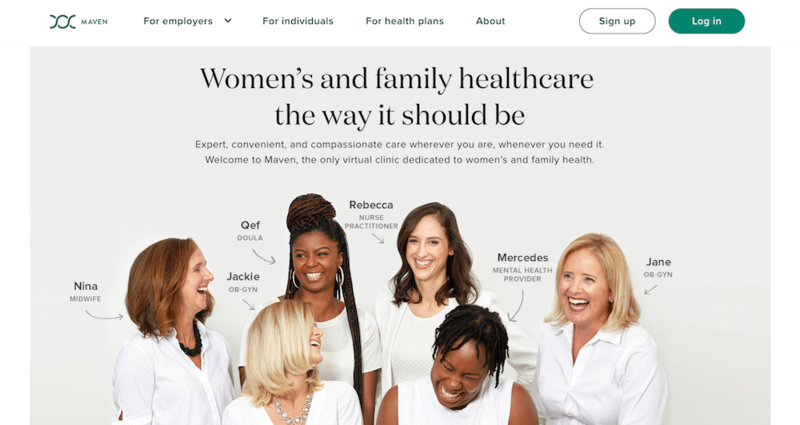 Maven Clinic is a women-centric healthcare platform whose mission is to assist mothers and families during conception, throughout pregnancy, and postpartum. The app and website provide a directory of practitioners in the women’s wellness field, with specialties ranging from midwives and doulas to nutritionists and therapists. For women seeking comprehensive care during a period of immense change (i.e., starting a family), this is a great way to find help at your fingertips. For new parents especially, the convenience of video chatting (rather than having to travel to the doctor’s office) to get consultations and prescriptions is a huge perk. As with other e-counseling platforms, there are limitations to a client-therapist relationship that is exclusively virtual. Maven Clinic does not accept health insurance. Due to licensing restrictions, prescriptions only available to users in certain states. When you’re ready to take the first step in your mental health journey, try Zencare. Watch introductory videos, book free phone consultations, and find the right therapist for you. Molli is Zencare's Content Marketing Strategist. She utilizes her editorial background to bust mental health stigmas and increase access to therapy through the power of the written word. Learn about what credentials psychologists have, the different types of psychologists, and how to find a psychologist who's right for you! There's a wide variety of different types of psychotherapies available, especially in a city as diverse as NYC! Learn more about where and how to find psychotherapy in NYC, how to afford sessions, and what you can expect in your psychotherapy appointments. If think you might want a holistic therapist but you’re not sure where to start, this guide can help point you in the right direction.